Richard went out of his way to help me with some finer aspects to my unit. The Yr 12 music unit I developed has allowed me to differentiate my instruction and run multiple units concurrently. The focus of the course is on creating quality, online units which promote collaboration and inquiry, based on social learning principles. In order to deliver quality social, online learning units, an exceptional online platform is required. During this self-paced course participants will source videos, learn to create quality videos, deliver videos via ‘the cloud’, create a quality online unit of work, trial it with students and report back on their implementation experience. In other words, this is very much a ‘doing’ course. Insight into various types of video suitable for online units of work. Guidance in choosing video recording and editing software, both free and paid. Several quality instructional videos produced by each participant and shared between participants. Examples of collaborative activities which can be incorporated into an online unit of work. Examples of quality, online, collaborative units of work. Various software tools and techniques useful for creating online units of work. Have you been frustrated by lost lessons and student absences? Been dabbling with blended learning units but it's all a bit too difficult and messy? Wish there was a better way to have students interact online and utilise social learning principles? A 'yes' to any of these questions, means this course is for you. Create an extra "you" in the classroom with this NESA accredited fifteen-hour course. Social learning - What is it? How do we engineer it? What features do we ideally require in an online system/platform in order to create collaborative, social learning units? Participants are guided through these questions, reflect and share their thoughts. There are 4 main types of videos which teachers can utilise in an online unit. These are explored along with different options for creating videos. Participants absorb and reflect upon this information and share their thoughts. TEAMS discuss the ideas from Modules 2, 3 and 4 relevant to their online unit. This module features numerous tutorials - in addition to links to company-generated tutorials - for creating screencasting videos for PC, Mac, iPads and tablets. Also tips for producing camera/phone videos. The 'case for editing videos' is also made, especially relevant for those creating videos on tablets. Participants work through the tutorials relevant to their needs, gain skills and then start creating videos for their collaborative online unit. When creating videos for online units participants need to understand video file types, the advantages of compressing videos and the ideal video sharing options via Google Drive, YouTube and Dropbox. It's all easy once you know how. Participants absorb and apply this information to share a video they created with course colleagues. Participants​ also write a peer review of another participant's video. Detailed tutorials for creating an online unit of work are featured. 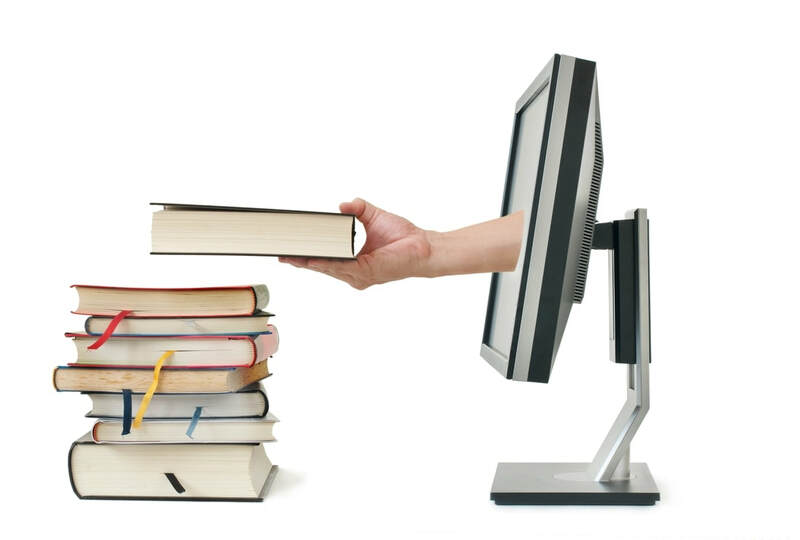 The tutorials are based on the Open Learning system but are applicable to other systems. Points covered include getting started, clever ideas for online units, avoiding ambiguity, creating modules, pages, and activities, arranging course content, the decision re page, pdf or Google Doc, making content easy to find, dealing with images, and more. Often the uninitiated do not think about how they will facilitate their online units until the time comes! This module guides participants through the following: the importance of setting up a test student in a test course to see how activities and facilitation appear to students, the implications of certain activities on facilitation, the setting up of comment threads and the administration of students. The Open Learning is used to showcase these strategies, however, the tutorials are also of benefit to those not using Open Learning. This module includes tips on implementing your online unit, suggestions for surveying your students and some extra related information. Participants submit their implementation report. The TEAM Leader guides TEAM members through collaboration on their implementations and implementation experiences. 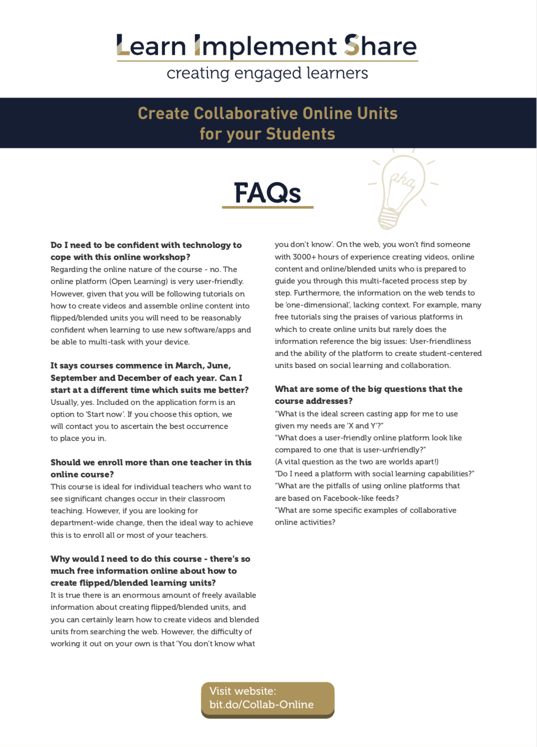 ”What are some specific examples of collaborative online activities? 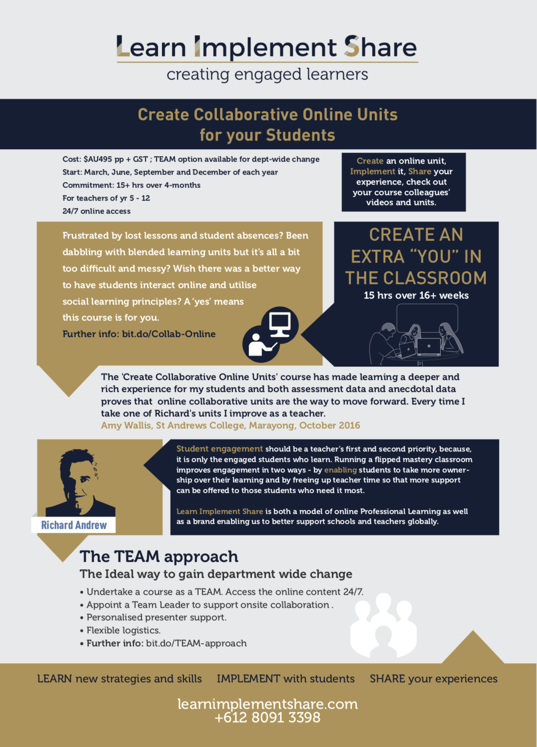 The course requires participants to create a collaborative, online unit, implement the unit with students and submit a report on the implementation experience. As part of the course, participants learn to create screencast videos and are encouraged to create a video overview of their unit. Some also use their video as their implementation report. Amy Wallis created an incredible unit in 2016. You may have seen some of it showcased in her video testimonial. Below is an edited 6-minute version of Amy's original video report. This course was so beneficial - it was one of the best professional development courses I have completed as it really made me utilise the new things that I have learnt. I was hoping to learn about creating and sharing my own videos and I have been able to successfully do that. One of the best aspects of the course is that it is self-paced and I can keep going back over the content when I need it. It was also lovely to have positive feedback and to see what others were working on.